It's 1973, and women's tennis superstar Billie Jean King (Emma Stone) is infuriated when she finds out that an upcoming tournament will offer the men's winner eight times as much as the women's champ. Disgusted by arguments such as "men are more exciting to watch" and "it's just biology," she and friend Gladys Heldman (Sarah Silverman) decide to set up their own tournament/tour  and the Women's Tennis Association is born. 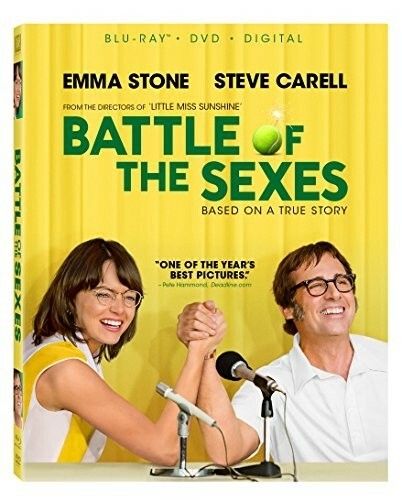 Meanwhile, former men's tennis star Bobby Riggs (Steve Carell)  stifled by the quiet, domestic life he shares with rich wife Priscilla (Elisabeth Shue)  comes up with the perfect idea to get himself back in the public eye: a big, publicized tennis match between him and King. She doesn't take the bait at first, but eventually King can't deny that it's her destiny to participate in the Battle of the Sexes.